Advanced Bathroom Renovations is the leading bathroom renovations specialists servicing Sydney´s Sutherland Shire, Menai, Cronulla and St George area of Sydney. Our Alfords Point workshop is home to a small but dedicated team of friendly professionals with 20 years’ experience. ABR´s licensed tradesmen do all types of wall and floor tilings, waterproofing, modifications and repairs for your bathroom. And we do it all at competitive, budget prices. As a fully licensed building company, we are committed to providing our customers with a high quality Bathroom Renovation services along with the best quality workmanship, materials and products. We work with you to come up with a design that suits your budget and needs — be it plumbing, wall and floor tilings, linings or any other repairs or renovations that your bathroom may require. Advanced Bathrooms is with you all the way, from start to finish. We won´t just renovate your bathroom, we´ll also help you choose and collect all types of fixtures and fittings. Alternatively we can go with you to our suppliers to help you to select your vanity, toilet, taps, accessories, wall and floor tiles. That way you will have a clear idea of how your new bathroom is going to turn out without any unwelcome surprises! When you’ve decided to undertake small bathroom renovations in Sydney, the first thing that’s worth considering is the type of renovations that you want done. There are a number of various categories of renovations which includes a partial renovation, and a complete renovation, while there are a number of other types in between the two these happen to be the most common types. When people consider getting their bathrooms partially renovated they mostly think about getting the tiles replaced and perhaps the faucets when in fact there are many other things that should be considered. The same goes for a complete renovation which can cost anywhere from a few hundred dollars to thousands of dollars depending on the extent and the quality of work that you choose. At Advanced Bathroom Renovations we have the experience to advise you on the best way to change the way your bathroom looks and feels based on your budget and needs. Everyone has an idea of what their bathroom should look and feel like. This is why almost every bathroom renovations in Sydney we have carried out over the past couple of years have been drastically different because everyone has a different goal. So, it’s always a good idea to discuss your vision and needs with us. The consultancy process helps us come up with the right way to renovate your bathroom based on the budget, extent of work needed and the types of accessories you are looking to install. We personally think that the key to a successful project is good discussion with the client to understand what they need. We have often been referred to as one of the most reputed bathroom renovation experts in Sydney. The reason being that we pride ourselves on always having the best people for the job, this is regardless of if you need tiles installed, a wash basin or perhaps the entire bathroom taken down and redone from scratch we can do it for you. Our professionals have been with us for a very long time, and are certified which makes their work second to none. We also make sure to use the best materials that money can buy. Our experience in this industry has proven that high quality materials despite being more expensive upfront end up lasting very long, so the result is a much better aesthetically appealing bathroom in many cases and it helps save in the long term because our clients do not need subsequent repairs and maintenance. We make sure to procure all the raw materials we use from sellers whom we know are trustworthy and credible. This is why we have no problem backing up the work we do with a comprehensive guarantee. We are the cheap bathroom renovations experts of choice in Sydney for an array of reasons. However, our 20 years of experience in an ever evolving and competitive industry is proof of the fact that we are good at what we do and listen to our clients. Over the years as you’d guess we have worked on dozens of large and small bathroom renovation projects for homes and businesses alike. So, we bring lots of experience to just about any renovation project and because of that there is no project that is too big or too difficult for us to handle. We have a team of ABR’s licensed tradesmen who handle everything from the floor tiling, to walls and water proofing, in addition to lots of different types of repairs. This ensures that regardless of what your goal may be you can trust us to deliver a service which is unsurpassed. 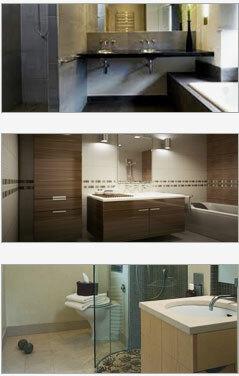 Advanced bathrooms is a one stop solution for all your bathroom renovation needs. We are not just renovators we can also help you pick the right fixtures and tiles for your bathroom. If you need to buy your own supplies, we can accompany you on the trip to ensure that everything from the vanity you invest in to the floor tiles you pick are the very best they can be for your budget. This for us is the best way to make the bathroom of your dreams possible and eliminate unwanted surprises. If you are looking for professionals then call us at 0412 276 517. You can also fill out our contact us form for more details.